After a long illness borne with great dignity, Stuart Smith passed away peacefully on the 25th February, at home in Curbar, Derbyshireand surrounded by his family. For Stuart who achieved much in so many ways, it is a difficult task to decide which details to include in this appreciation! Everyone has described him as a decent and kind gentleman who was quite unassuming. However, if he had come to a particular conclusion based on evidence he would hold firm (a characteristic of the Yorkshireman that he was). Always, tricky matters were handled with care and tact. Not only, did he give much time and effort to the Study Circle as an organisation, individual members were helped in every way. His attention to detail and adherence to a policy of evidence-based conclusions in Bulletin articles came from his scientific training combined with experience in business. An interest in science at school took him into chemistry and the dye industry in Yorkshire, where textile manufacturing was a staple industry. Starting from the laboratory bench, he rose through his knowledge and work ethic. He was greatly respected at all levels in the industry. In 1974 he launched a company that manufactures textile testing and laboratory equipment. Under his leadership, that company grew to become a market leaderby the time he retired in 1995. That year the Society of Dyers and Colourists elected Stuart as its President in recognition of his "outstanding" contribution to its objectives (education, advancing science & technology). News of his death produced this comment:"The textile world lost a real giant this week: Stuart Smith". As a young man Stuart was conscripted into the British Army for National (military) Service. Stuart recalled that, on discovering he was a scientist the Army posted him to the Royal Army Ordnance Corps for bomb disposal. Although he did not follow the reasoning for this, he found the work interesting - there was a lot to do, travelling throughout the country and good camaraderie. Stuart married Joan in 1958 and they were blessed with two daughters, Sallie and Jane. Family life was most important to him and great happiness and enjoyment arrived in the form of four grandchildren. Not only was Joan his partner in life, but also in business. The success of their company resulted from the complementary skills they contributed. Retirement and moving to Curbar gave Stuart the opportunity to indulge in another relaxing pastime, gardening. Over two decades he created a wonderful garden set in one of the most beautiful parts of England. Like many of us, Stuart began a life-long passion for philately as a schoolboy with an album given as a present by a close relative. An occasional treat of a 6d (3¢) "schoolboy packet" of stamps revealed their fascinating diversity, but it was the letters from his Auntie Josie in Africa that converted him into a Belgian Congo collector. By his late teens he was seeking out rarities for his Congo collection. Like many, he admired the Mols issue and took on the challenge of specialising. He shared his success in identifying plate combinations with fellow members though his series of twelve articles that were published in the Bulletin between2002 and2012. (He had intended to present these together in a book,Identification of the Mols Plate Combinations, after that.) This study was crowned with a Goldat the 94th Philatelic Congress of Great Britain (Perth 2012) for his entry,Belgian Congo - Plates of the 15 Centimes Mols 1896 - 1922. This recognition gave him particular pleasure, though he was quite self-effacing when the topic was raised. Stuart's devotion to theMols issues did not preclude an interest in other philatelic topics. An outstanding collection of the Postal History of Derbyshire, focused on the town of Bakewell, was built in parallel. On this, he was acknowledged as an authority and known to possess "some very nice pieces" including some of its earliest recorded postmarks. Stuart's association with the Study Circle began in 1973, when he joined and for the following 40 years was a cornerstone in its management. The list of offices he held is a testament to this. In each of these he served us enthusiastically and ably. In his time as Editor, he continued to improve the Bulletin, introducing both colour and electronic distribution in 2005. He considered the Bulletin the equal of other specialist society journals and his entry at Espania 06 - Exposition Mundial de Filatelia was rewarded with a Large Silver. 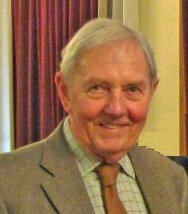 He retired from the Editorship just a week before his death, but not before he had made arrangements to ensure that the Bulletin will continue at the high standard he set. He will be missed by us, as a friend, as a philatelist with a font of knowledge and as a cement holding the Study Circle together. It was a privilige to have have known him. Our sympathies are with Joan, Sallie, Jane and Stuart's grandchildren.